Whether you started work 20 years ago or graduated this summer, you feel it. Whether you are single or have a partner, have kids, pets or plants, there is a growing perception that there is no such thing as real ‘down time’ anymore. 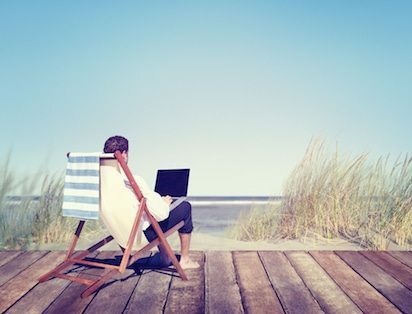 We bring our tech with us to the beach and our kids wonder why we tell them to stop playing Minecraft while we create and dismantle our own creative worlds with the spreadsheets, presentations and directives that we send by email, Slack, messenger and text. Our friends think we’re having an amazing vacation because they see our instagram photos and snapchats but, in between, we’re fielding calls to calm the latest storm in a teacup. So now what? Do we stop trying to get a life and dive into the job? Or maybe quit our jobs and travel the world for a year. We’ve tried both and can confirm that neither are sustainable. There’s no one-size-fits-all to this one, but here are a few things that have worked (at least some of the time) for us. 1. Forget about the guilt. Guilt and self-imposed stress are a waste of time and a good way to lose precious sleep. Don’t strive for perfection all the time and learn to master the 80/20 rule; you can generally do 80% of the work in 20% of the time. Figure out what counts most and stick to that. And get more sleep. Learn to recognize the difference between the Urgent and the Important. In terms of scheduling, the “Urgent” tends to take care of itself, but the “Important” has to be planned. These are the ‘Big Rocks’; put them in the road first; then, if you have to move them later, at least you know it’s because it’s necessary and not because you forgot to put it on your calendar. 3. Plan with your partner. If you have a partner, sit down and work out what you want to achieve together rather than as individuals. You can achieve far more if you work together rather than constantly bumping heads on the road to the top. Not sure where to start? Create individual bucket lists and then share them to start a conversation. 4. Find joy in what you do. I’ve met people who work 70+ hours a week and think they have a great work-life balance and people who work 40 hours a week and feel like they have no life at all. It’s all about attitude. If you love what you do, believe that you are achieving your goals and making a positive contribution, then the work feels less like work and more like life. If there’s no joy, then it’s time for a change. Sometimes, it’s about learning to say ‘no’. At other times, it means stepping way out of our comfort zone and taking a risk on something new. Not choosing is also a choice; don’t wait for life to happen to you. As a very smart friend once said: ‘You can’t control what happens to you, you can only control what you do about it’. If you want a balance that works for you, then work for it. And own the result, imperfections and all.